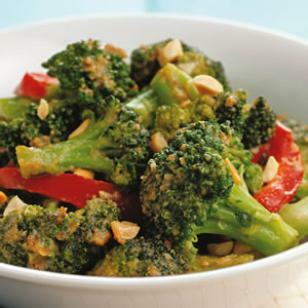 Broccoli and red bell pepper tossed with a spicy peanut sauce makes a delicious side or stir in some cooked chicken or tofu to make it a main dish. Whisk peanut butter, 1/4 cup water, brown sugar, 1 tablespoon soy sauce and vinegar in a medium bowl until smooth. Set aside. Heat oil in a wok or large skillet over medium heat. Add broccoli and cook, stirring frequently, until beginning to soften and brown in spots, about 6 minutes. Add the remaining 1/4 cup water and 1 tablespoon soy sauce to the pan along with bell pepper and garlic. Cook, stirring frequently, until the pepper has softened and the liquid has evaporated, 2 to 4 minutes. Remove from the heat; stir in the reserved peanut sauce and season with crushed red pepper. Garnish with peanuts.